chocolate cookie cakes: How to make decorated cookie "cakes"
It’s hard to ship a cake, so for my sister’s birthday, I (of course) made cookies instead. 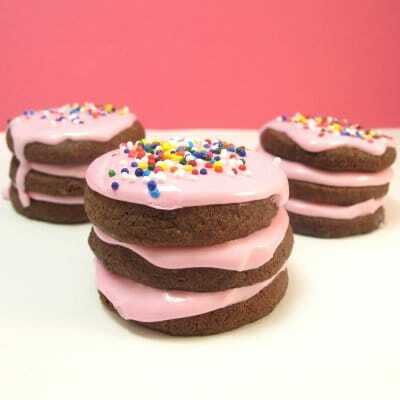 By simply stacking tiny chocolate circle cookies with frosting, and adding a tad of sprinkle garnish, you can easily create these chocolate cookie”cakes.” I used my royal icing recipe, because I needed the frosting to dry enough to ship, but you can also use buttercream if you prefer. You can use any recipe for chocolate rolled sugar cookies, but I’ve provided the recipe for my chocolate cookies from my book at the end of this post. They hold their shape well and taste yummy. If you wrap in cello bags with ribbon, let dry overnight first. All of the above should be found at craft stores, including frosting color, but for Americolor products, you may have to try specialty stores or the internet. Roll out chilled dough on a lightly floured surface (the flour will show, but should blend into the cookie, or you can roll between two pieces of wax paper in lieu of using flour), cut out circles and place on a parchment paper-lined baking tray, and bake according to the recipe. I planned on 3 circles per cake. Let cool. Assemble a frosting bag with size “5” tip. Mix about 1 cup of frosting light pink and fill bag with a little more than half of the frosting. Tie closed tightly with a rubber band. 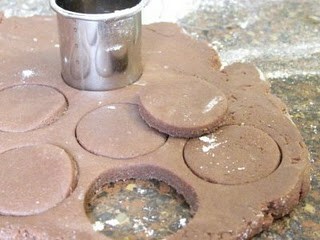 Outline a cookie with the frosting, and pipe frosting back and forth to fill circle. Repeat with a second cookie. Stack one cookie on top of the other. Stack an undecorated third cookie on top. Usually for flooding you pipe a circle, let set, and fill in with runny icing. To make these look like “cakes,” I omitted the hardened circle. Thin remaining icing with water, a few drops at a time, until the consistency of a thick glue. The frosting shouldn’t be quite as runny as when you flood, it should be slightly thicker. With a small spoon or squeeze bottle, pour thinned frosting on center of top cookie and let gravity do its job. You can nudge slow frosting with the back of the spoon. 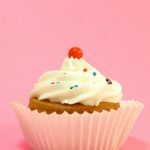 In lieu of thinning the frosting, you can also just cover the top with piped frosting from your bag, as long as the icing isn’t too too thick. Sprinkle with sprinkles, if desired. Let set. Blend butter and sugar on medium speed with an electric hand mixer or with the paddle in a standing mixer. Add egg and vanilla and blend. Mix dry ingredients and gradually mix in. Wrap dough and chill for at least one hour. Roll out on a floured surface, cut shapes, and bake on a parchment paper-lined baking tray in a preheated 375 degree oven for 12 to 14 minutes. Yields about 60 small circles. 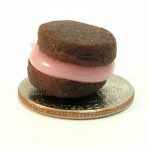 I love it – anything in mini is so great, so the effect of getting a mini cake is fun. Wow, I love these, I agree, anything mini is fun, and these would look particularly great amongst a table full of goodies at a high tea party! I would feel very special if these arrived in the mail for me too! I bet your sister thoroughly enjoyed them! Thank you for providing the recipe!! Those are so pretty!! I love the idea! SO stinking cute!!! Love, love, love this…can you move closer? Can we move into your basement? oneordinaryday–thanks! ps. 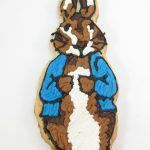 I left a comment on your blog today! apparentlyjessy–ooooh, good idea. I’d love to throw a mad hatter tea party. Jennifer–haha, funny you say that! We sold our house and are living with friends until we close on a house (what I thought’d be 3 weeks has turned into 3 months! they are wonderful people though we’ve totally overstayed our welcome), but if we ever get a basement you’re welcome! I loved this and used one of your pics on my blog, if that is not okay, or you want me to do the credits different, just let me know! (3)Posting my site on that FABU craft site?! Wanna be best friends forever? I’ll mail you half of a heart cookie and we can wear them ’round our necks for alltime. Seriously biggest thanks. and thanks. and thanks. I loved this idea and I’m sure your sis was glad to receive it! Very creative and cute, too! I am really enjoying visiting your blog daily! You have such wonderful ideas. I actually have a question….I was wondering if you had a good cake frosting recipe. I am absolutly loving your cookie dough and cookie frosting recipe. Thanks Valerie. When I make cakes/cupcakes, I use buttercream (and Dunkin Hines moist deluxe cake mix made with oil…I’m not usually a mix baker except for cakes, and I love this mix, esp. with homemade frosting). I frost the cake with buttercream (which can be tinted with frosting color), but tend to still use my other recipe for decorations, just because it’s more user-friendly. Also, I’m not a great spreader. It takes a good hand to get the buttercream smooth. But it tastes great. And one more tip before the recipe, I always use Americolor soft gel pastes for tinting because they are tasteless. I find the gels from the craft store taste metallic. 3 Tblsp or more milk. Cream the sugar/butter, add the rest and blend. Add milk or confectioner’s sugar to thin/thicken respectively. Thank you Chic Cookies!!!!! I really appreciate the help!! One other question if you have time, this will really show my igornance, is there a difference or what is the difference between the confectioner’s sugar in a box and in a bag? No difference between box and bag except size! Usually (but check the label) the bag has about 2 pounds of sugar and the box is only 1 pound. For frosting one cake or a batch of cupcakes, you only need 1 pound, hence the box. When making my other frosting for decorating, you need a lot more sugar, so I use the bag. But regardless, it’s usually cheaper to buy the bag overall and just use half (or a little more than half? I think a box works out to a couple of cups) for buttercream. I always have a few bags on hand. And frosting is forgiving. You can keep adding sugar til you get the right consistency or thin with milk or water if you add too much. Instead of rolling them on flour, you could use cocoa powder so it will blend in perfectly. Great tip Anonymous! I sometimes roll between wax paper, bur for some reason, I don’t like doing that with dough. I feel like I have less control. Cocoa powder’s a great (and yummy) alternative! I want to thank you for these recipes! 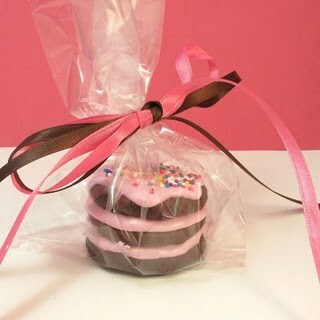 Your post was the inspiration for cookie favors I made for a friend's bachelorette party!